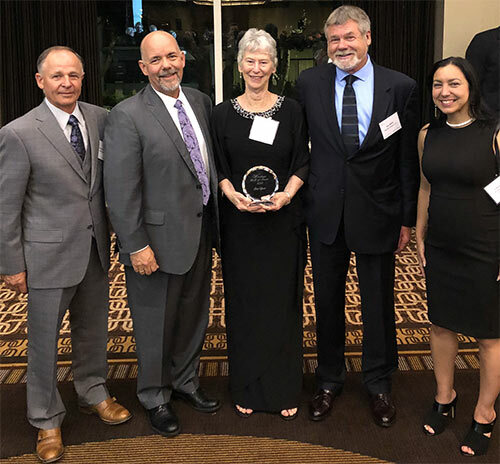 Pat Cipov, center, was the guest of honor last night when she was inducted into the Wireless Hall of Fame alongside luminaries such as Marty Cooper, the acknowledged inventor of the cell phone. The Wireless History Foundation (WHF) inducted five individuals into the prestigious Wireless Hall of Fame during an awards ceremony that was held last night at the Omni Hotel in Los Angeles, Calif. The Wireless Hall of Fame event was held in conjunction with the 2018 Mobile World Congress Americas Conference that is taking place this week in Los Angeles. The Wireless History Foundation is a nonprofit organization formed to preserve and promote the history of the wireless industry. The Wireless Hall of Fame program recognizes outstanding achievement across all disciplines of the wireless industry. Celebrating Pat Cipov’s induction into the Wireless Hall of Fame are National Association of Tower Erectors Board of Directors members, from left, Randy Scott of Texoma Contracting, Jim Tracy of Legacy Telecommunications, Jim Miller of EasTex Tower, and Shama Ray of Above All Tower Climbing. 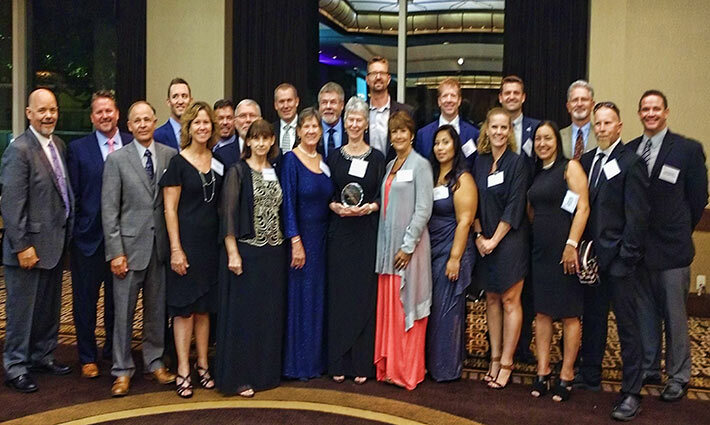 With her historic induction, Pat Cipov becomes the second National Association of Tower Erectors (NATE) member tower contractor company executive to be enshrined into the exclusive Wireless Hall of Fame fraternity, following in the footsteps of Bill Carlson’s 2014 induction honor. In 1995, Pat’s company, Cipov Enterprises, Inc. became one of 60 founding member companies of NATE. As a former technician with experience climbing communication towers, Pat’s industry field knowledge and business acumen quickly helped her ascend the leadership ranks within the Association. Cipov was first elected to the NATE Board of Directors in 2000 and was later elected in 2006 by her peers to serve on the Executive Committee. In 2013, Pat made history by becoming the first woman to serve as Chair of the Association. 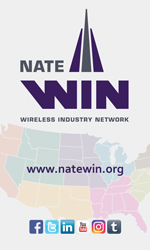 In her role as NATE Chairwoman, Pat played a pivotal role in establishing the Wireless Industry Safety Task Force which consisted of top safety and operations executives representing the wireless carriers, tower owners, OEM’s and turnkey/construction management firms. The groundwork established by the Wireless Industry Safety Task Force later led to the formation of the National Wireless Safety Alliance (NWSA), an assessment and certification organization. The NWSA’s nationwide and portable credentialing system has been a game-changer in the industry from a workforce development and safety perspective. Pat also has leveraged her platform at NATE to pave the way for the next generation of women to assume leadership roles in the industry and has contributed her time and talents to mentor many of the women from the industry who are now intimately involved in leadership roles at their respective companies and with the Association. “I am honored and humbled to accept this award and to join past Wireless Hall of Fame inductees who I have long admired and respected,” said Pat Cipov. “ I also want to congratulate the other members of the Wireless Hall of Fame Class of 2018, it is truly an honor to be going into the Hall with such an outstanding group,” added Cipov. Barry A. Adelman: In the early days of the U.S. wireless industry every issue was novel: the application process, combinations into partnerships and combination of partnerships, vendor agreements, buying infrastructure, and mergers and acquisitions. Although he represented individual wireless clients, Barry served as a powerful and essential representative of the industry as a whole. He was a central figure in creating the framework for an industry that now represents essential 21st Century infrastructure. His leadership and influence in the wireless industry have continued for decades. Alain Maloberti: From 1985 to 1995, Alain served as the first chairman of the European standards group ETSI SMG2, the group that standardized the GSM radio interface. This group faced a highly technical and political challenge in navigating the selection of the narrowband TDMA technology that paved the way for the success of GSM. In addition to his work with the ETSI standards group, Alain held executive roles with France Telecom /Orange, which he joined in 1979, moving to the mobile business in 1983. Liz Maxfield: In addition to playing a key role in the preservation of the history of the wireless industry as a founder of Wireless History Foundation and the Foundation’s first Executive Director, Liz was instrumental in the early development of the cellular industry from working on many of the first FCC license filings to facilitating the establishment and operation of inter-carrier information exchanges which help lay the foundation for seamless roaming. Liz retired from her day-to-day role in the Foundation in 2016 but still serves as an instrumental volunteer and board member. Ed Reynolds: Over a career spanning several decades, Ed led the implementation of multiple wireless technologies from analog to 4G that shaped the wireless revolution. As Chief Network Officer of Cingular, he was a key member of the team that led the integration of the Cingular and AT&T Wireless networks, successfully integrating two large overlapping networks and creating the largest wireless network at the time. After his retirement, Ed was appointed in 2012 to the initial Board of Directors of FirstNet, where he served until 2018. 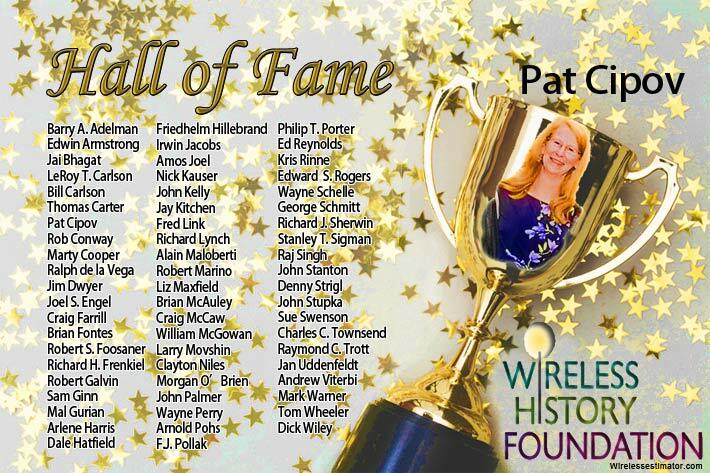 The Wireless History Foundation honored Pat Cipov last night when she was inducted into the Wireless Hall of Fame, the most recognized and highest honor accorded to an industry leader.